We continue our series of short videos talking about an idea or observation that was learned this week. This week I share some thoughts during a bike ride about the tradeoffs between playing it safe by blending in and taking the risk of standing out. What's your take? Let me know how you've wrestled with the issue of blending in and standing out. What have you been learning lately? Please e-mail me (show [AT] PeopleAndProjectsPodcast [DOT] com) or leave a message on our Listener Feedback Line (847-550-3747). I look forward to hearing from you! We continue our series of short videos talking about an idea or observation that was learned this week. This week I share some thoughts from two quotes that I came across this week. Where we focus makes all the difference, and there's a danger if we focus too much on ourselves instead of the customer. The second quote is related to getting support and buy-in. When you're faced with having to perform and the stakes are high, it's normal to start feeling nervous. But there's little evidence that just telling someone to "calm down" will provide any benefit. In fact, it might make it worse. So, what does work? HBR Senior Editor Dan McGinn has a new book that takes on this very topic. In Psyched Up: How the Science of Mental Preparation Can Help You Succeed, Dan shares evidence-based insights on how you can overcome your pre-performance anxiety. What allows you to walk onto the stage or into the testing center or into that meeting room with the eye of the tiger? Dan shares his insights in this episode. Performance Breakthrough: A Radical Approach to Success at Work, by Cathy Salit. Shakespeare wasn't kidding when he said "All the world's a stage!" Cathy suggests that every interaction is a performance, and when we can see life through that lens, much growth and learning is possible. Our video discussion is at http://PeopleAndProjectsPodcast.com/149. DARKENING DEVELOPMENTS by Kevin Macleod Licensed under a Creative Commons: Attribution 3.0 License. Brain Rules (Updated and Expanded): 12 Principles for Surviving and Thriving at Work, Home, and School. 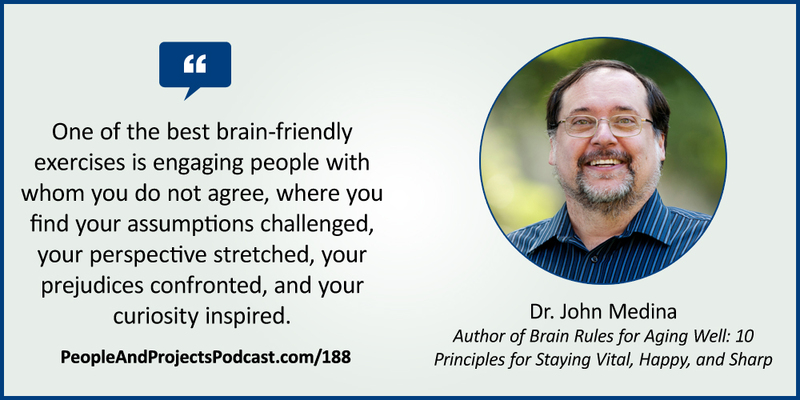 It's one of the best evidence-based, completely accessible books on how to live a brain-friendly life. Brain Rules for Baby (Updated and Expanded): How to Raise a Smart and Happy Child from Zero to Five. This is a fantastic book filled with insights on how to raise a child in a brain-friendly way. BRAINWAVES by Strong Suit is Licensed under a Attribution-ShareALike License.